Why Are So Many Low-Income People In Massachusetts Still Uninsured? A new report by the state’s Health Connector and the Department of Revenue has rekindled my curiosity and concern about two questions regarding Massachusetts health reform: Why does Massachusetts still have so many low-income people who are uninsured? And what can we do about it? The Connector/DOR report presents an analysis of the health insurance status of adults in the state, based on 2009 state tax filings. The analysis uses the HC forms that most of us are required to fill out as part of our annual state tax return. The good news from this figure is that only 13% of people who were uninsured for the full year (or ~22,000 people) lacked coverage because they could not find any affordable plan. Of course, now that we have a state affordability schedule, even one person who can’t find affordable coverage is an official public policy problem. But a lack of affordable coverage is not an issue for a huge number of people. Another positive finding from this chart: only 17% of the full-year uninsured, or about 29,000, are uninsured because they chose to pay a tax penalty instead of buying affordable coverage that was available to them. This means that only 7/10 of one percent of all the adult tax filers in Massachusetts chose to pay a tax penalty rather than purchase affordable health insurance. Not the kind of widespread rejection of the individual mandate that all the strum und drang on the national level would suggest. What troubles me in looking at this chart is that two-thirds of the full-year uninsured, or 114,000 people, had incomes below 150% of the Federal Poverty Level (FPL). In 2009, this was less than $16,245 annually for a single person and below $33,025 for a family of four. The percent was similar in the 2008 Connector/DOR report. Most adults in Massachusetts at this income level should be eligible for Commonwealth Care with no premium to pay, and some would be eligible for Medicaid, also with no premium to pay. The exceptions would be people otherwise eligible for Commonwealth Care who have employer-sponsored coverage available to them, people who are undocumented, and legal non-citizens with special status who cannot get into the Commonwealth Care Bridge program, which has capped enrollment. The number of people in these groups among tax filers would be relatively small. So this means that most of the uninsured in the state are eligible for free public health insurance. 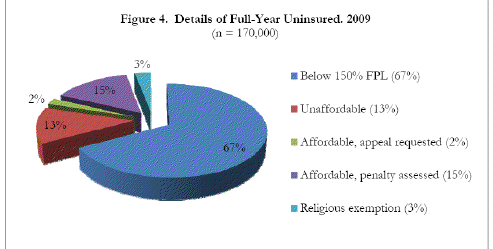 --Analyze the state tax filings to determine how many of the low-income people who were uninsured in 2009 were also uninsured in 2008. This would help us understand if this is largely a static group that is continually uninsured or a changing group of people. --Increase outreach to low-income individuals who are “chronically” uninsured to try to get them enrolled in coverage. Now that we have the state tax filing information, it’s possible to identify low-income individuals who are uninsured year after year, and develop some new strategies and initiatives to help them enroll in public programs for which they are eligible. Advocates and community-based organizations need to be key partners with the state in thinking through how to best attack this problem. Of course, if we were to be successful in getting most of the low-income uninsured into public programs, this would have a significant impact on spending for Commonwealth Care and Medicaid. Let’s add this to the growing list of reasons why we need to get health care costs and spending under control. But allowing 100,000 people who are likely eligible for public programs to remain uninsured is not an acceptable cost containment strategy. PS: Speaking of health care spending, we’re #1 again! According to an article on personal health care spending by state in the most recent version of Medicare and Medicaid Research Review, Massachusetts had the highest health spending per capita of any state in 2009, at $9,278, 36% higher than the US average. In terms of recent spending growth, the article found that over the period 2004-2009, Massachusetts was tied for 5th place among states, with an annual growth rate of 5.8%, higher than every state but Alaska (6.9%), New Mexico (6.6%), New Hampshire (6.5%, and Hawaii (6.0%) and tied with Wyoming and Washington. If Rachel and Carey will let me, I’ll blog soon about the interesting patterns of Medicare and Medicaid spending by state in this article because I sense a battle about to heat up about cost-shifting, that favorite boogey-man of private health insurers who don’t want to admit that they have insufficient power to address a dysfunctional market because it might lead to r-e-g-u-l-a-t-i-o-n. This program aired on December 13, 2011. The audio for this program is not available.